B&O brings Google Assistant to high-end BeoSound wireless speakers | What Hi-Fi? Say hello to two extravagant smart speakers. B&O hasn’t been short of announcements this IFA, having quite literally lifted the cloth off its new Edge wireless speaker, as well as announcing its Beoplay E6 wireless in-ears and a ‘winter collection’ of mauve-coloured headphones and wireless speakers. 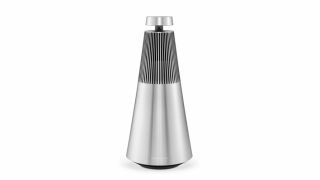 The Danish brand has also used the European show to announce new versions of its 2016-launched BeoSound 1 and BeoSound premium wireless speakers with Google Assistant voice control. Sadly for existing owners of those speakers, this isn't a software update but two brand new models with hardware changes. The speakers are much the same as their predecessors in form, but to ensure Google Assistant can hear commands during music playback, they feature ‘echo-cancelling’ technology and five microphones into the aluminium structure that constantly analyse which sounds come from the speaker and which are commands from the user. The Chromecast and Apple AirPlay 2 speakers also feature four shortcut buttons on the top touch panel that allow the user to assign either a favourite radio station, music playlist or the reading out of a weather report or calendar entry. The buttons work with any device and music service that are Google Assistant compatible. The new Beosound 1 (£1250) and Beosound 2 (£1650) should be available in the next month or two.